It has been a tough few weeks for global urea suppliers. Granular urea values have fallen in a number of key markets, most notably the US Gulf, where prompt urea barges no longer attract a $60ps ton premium on deferred product. Barge values in Nola are now comfortably below $300ps ton, well below the mid-June peak of $380ps ton. While upriver barges were still attracting a premium last week, it is clear that there is a lack of conviction in the US market – something that is evident in all other key markets – with buyers anticipating lower values as Q3 progresses. With returns for Middle East cargoes to the US waning, Profercy’s price quote for Arab Gulf granular urea has fallen significantly in the last two weeks. With urea representing over 60% of nitrogen trade, and with Middle East urea values a key market barometer, this had led to a 13 point drop in the Nitrogen Index in the last month. Indeed, the Index lost over 5 points last week and is only 2.69 points above the mid-April low of 137.55 (as charted below). 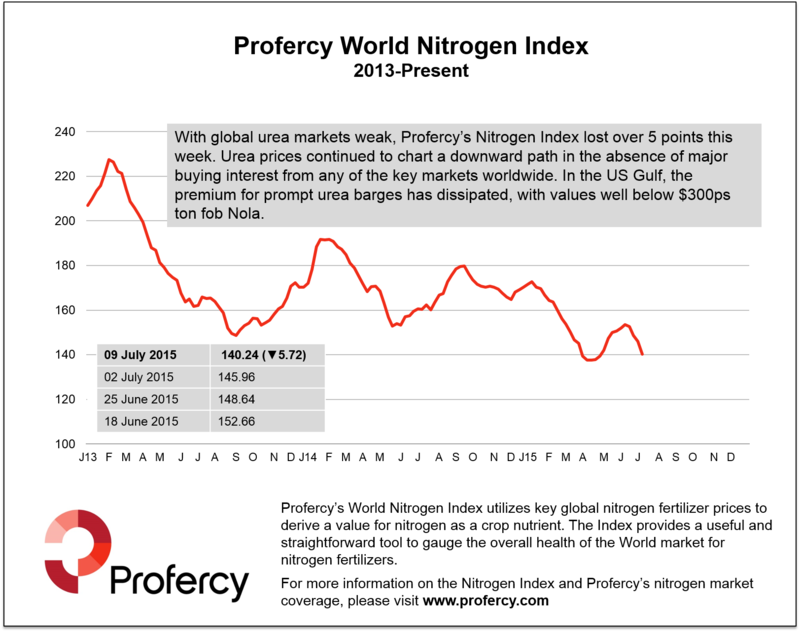 Price data derived from price assessments published through the Profercy Nitrogen Service. For more information, please click here. 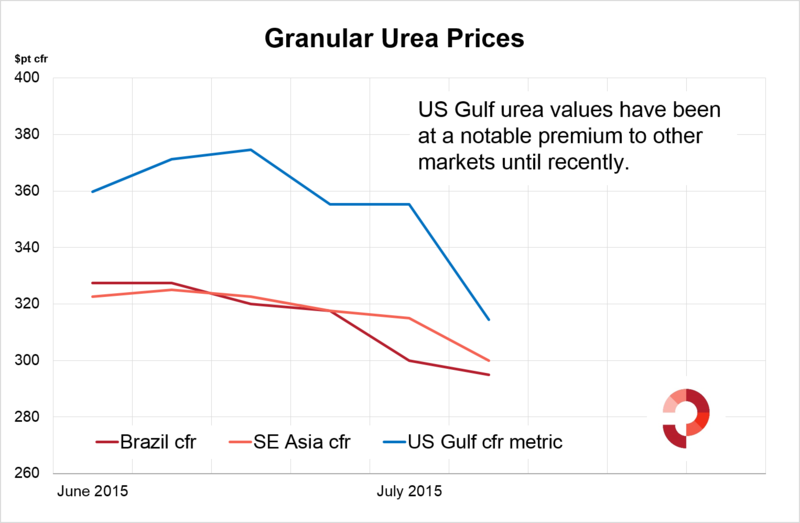 Where next for global urea values? Profercy’s end-June forecast report highlighted that surpluses were expected to build throughout Q3. Major supply additions will be seen in North America, North Africa and the Middle East at a time when demand is slow in key import markets. A significant anomaly at present is the high level of offers for Chinese prilled and granular urea. This is generally valued more than $10pt lower than Middle East granular urea. However, for the second time this year, Chinese producers are holding values up to $10pt above product from the Arab Gulf.